When the Seoul Station overpass was closed to traffic in November 2015, many had no doubt it was time. After failing its vehicle assessment, the overpass was transformed into Seoullo 7017 -- a reference to original construction year of 1970 and its 2017 transformation -- where people can walk high above the maddening traffic below, enjoying a panoramic view of the city. As a rest area and tourist attraction with cafes, galleries and performance activities, the elevated garden park modeled on New York’s High Line is part of a larger urban regeneration effort by the capital city, led by Seoul Mayor Park Won-soon. “In the past, Seoul focused on quantitative development and expansion in preparing for housing and population growth. Now, we need to switch to new regional development plans through physical regeneration (of decayed areas) and renewal,” Park told The Korea Herald. 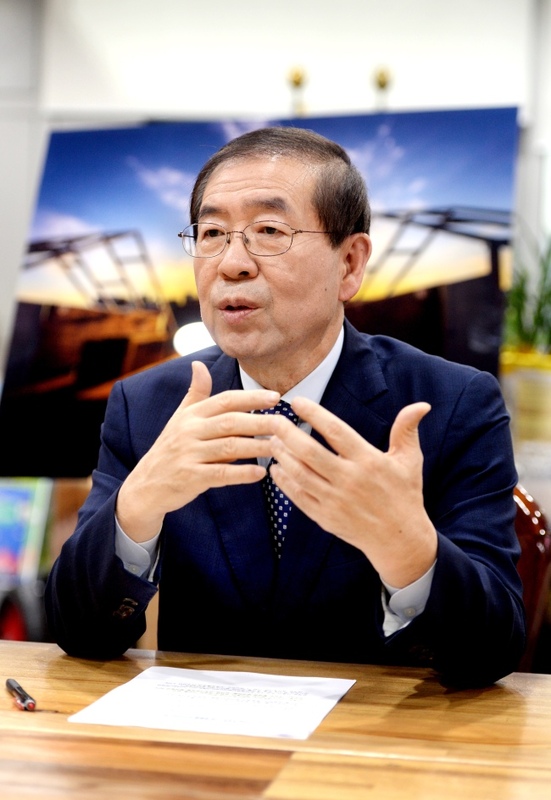 His intensity when speaking about urban renewal was a reminder of the difficulty in addressing the disparity between the more affluent areas south of Han River and the older areas north of the river. At the time of the 2011 local elections when the former lawyer-turned-civic activist won the Seoul mayor’s seat as an independent candidate, the concept of urban regeneration not familiar to most people. In fact, conservative mayors Lee Myung-bak and Oh Se-hoon who preceded him did quite the opposite. As advocates of redevelopment as part of urban renewal, the two mayors insisted citywide reconstruction was needed to turn underprivileged housing areas into high-quality residential environments. The new town policy, however, resulted in gentrification due to a sharp increase in real estate prices, displacing poor tenants. A shift is needed from expansion to consolidation and renewal, insists Park. “Our urban planning should be different from that of rapidly growing Singapore or Hong Kong. Seoul has 2,000 years of history and enjoys beautiful natural environment surrounding the city with the clear flowing Han River. We need socio-ecological planning and a regional land use policy to preserve that. Just like what London and Paris are doing to regenerate architecture and old buildings to blend them into some thousand years of their history and cityscape,” Park said. The run-down Sewoon Shopping Center in central Seoul reopened last year after renovation, adding to the growing list of urban regeneration projects and city design plans that now totals 131. Once the go-to place for electronics, Sewoon went into decline with the emergence of Yongsan electronics market in the late 1980s. The remodeled space is now a tourist attraction with observation decks and gardens, while providing offices for startups run by subsidies. Critics, however, point out space remodeling that is most concentrated in less affluent northern Seoul that deprives residents there of opportunities to accumulate wealth generated by property value increases through redevelopment and reconstruction. Park acknowledges the claim, saying that it is only natural to have a different interest groups in areas earmarked for renewal. “Some might want an increase in their properties’ value, while others hope to keep belonging to their neighborhoods without displacement. We should take all of the factors into consideration to either redevelop decaying urban regions or just simply regenerate underused or underutilized places. What we know for sure is we don’t need another matchbox-like apartment to be built, demolishing heritage buildings and neighborhoods with rich history,” Park said. The model of developing the city through regeneration, is also a key to improving Seoul’s worsening air pollution, according to the mayor. “The urban regeneration effort is also creating more bike paths, pedestrian-only roads and redesigned sidewalks to make them more pedestrian-friendly as a way to reduce energy waste. About 39 percent of fine dust emissions are generated by domestic environmental factors, including toxic pollution emissions from vehicles and heavy equipment. The pedestrian-friendly city will encourage more people to leave their cars at home,” Park said.